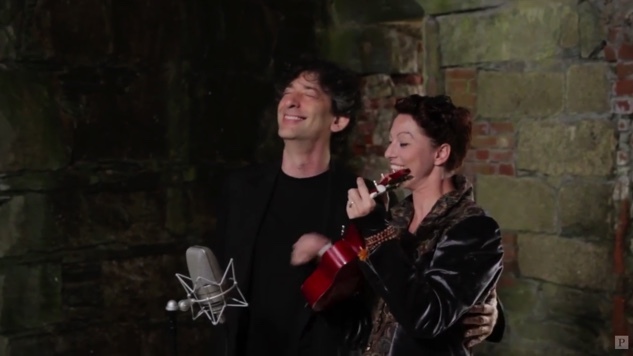 Watch Amanda Palmer and Neil Gaiman Duet "Makin' Whoopee"
Five years ago today, Amanda Palmer surprised us with a guest vocalist during her Paste Session at the Newport Folk Festival—her husband, author Neil Gaiman. On July 26, 2013, at the Paste Ruins in an abandoned part of Fort Adams—an 18th century military post on the festival grounds—Palmer played a pair of songs for an intimate crowd and our cameras. Gaiman comes out after the first chorus, and despite a false start in the wrong key and the fact that he’s a better writer than singer, seeing the couple perform together is pretty adorable.